Anyway, doing my part, I made a cake for the cake walk. I know it's a carnival but I just couldn't make a clown cake. Clowns are creepy. 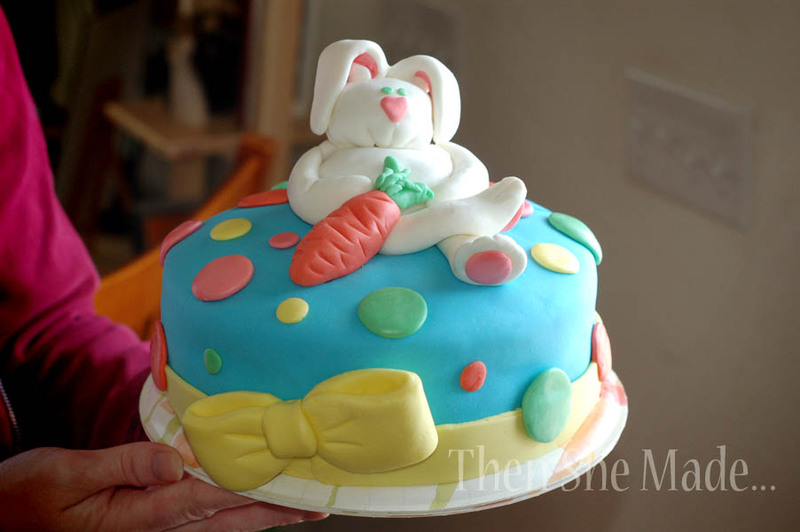 And, I wasn't really feeling anything else so, instead, I made a spring/Easter cake. I wasn't sure if my ideas were going to work so I didn't take step-by-step photos, but I did explain a little about how I made it below. The cake is three round cakes, stacked and crumb frosted then covered with blue marshmallow fondant. The head was made by cutting down a cupcake and wrapping it in fondant as well. Everything else is just decorated with fondant, nothing to overly hard, it's cute though and my girls loved it. So, there you have it. That's what I've been working on. Luckily, there's more to crafting to come, too. I feel like I've been in a bit of a slump but the creative juices are flowing again, which feels great. Ok seriously? Could you be any more talented??? No, I didn't think so. So cute! You did a great job and I love the colors you used. Your cake is amazing!!!! Love it! Oh my goodness! I love this! I think it looks better with him lounging! Just wanted to let you know that I featured you on WhipperBerry today! Kisses. that is adorable so glad I found you on Whipperberry I am your newest follower!! Have a great weekend and a blessed Easter!! What a beautiful cake. I am a new follower.